Traditions are important. They are a reflection and a mark of respect to our ancestors before us. Although, does respecting tradition mean that you need to take everything on blind faith? Or that you shouldn’t think for yourself, or decide if it’s appropriate to follow some of the old traditions in the modern world? Every religion and culture has their own traditions, and aspects unique to them. However, certain traditions followed by some people are simply too hard to swallow. Some of these traditions are odd, bizarre, and some are fatal. 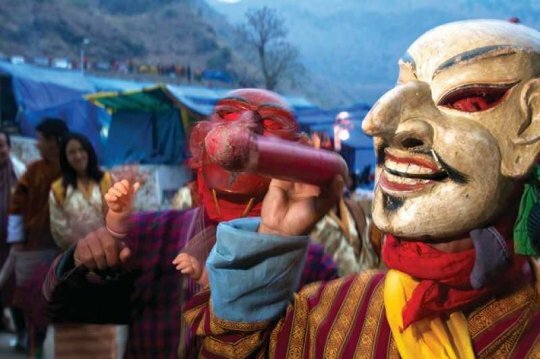 Here’s six of the creepiest traditions that still exist in the world. #1 - Hindu Thaipusam festival piercings. 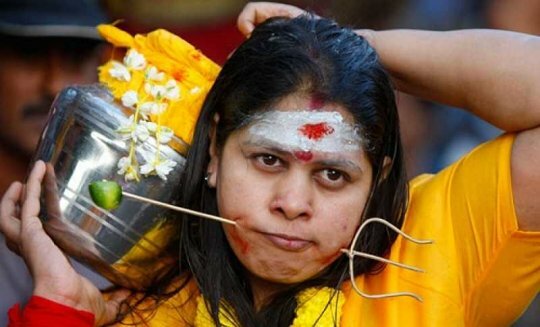 Thaipusam is a festival in Singapore celebrated by Hindu devotees. During the festival, the devotees fast, believing that it will cleanse the body. They combine the fast with body piercings. Some devotees will carry a milk pot as well, which can be quite painful. Thaipusam happens on the night of a full moon during the Tamil month of Thai. Bullet ants have a sting that is 30 times more painful than a bee’s. 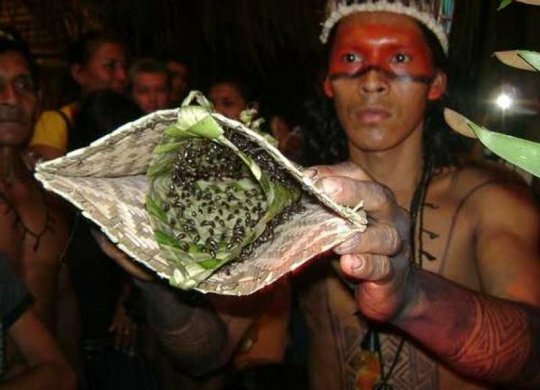 The boys of an Amazonian tribe have to wear woven mitts containing these ants when they come of age. This is to prove their manhood. They leave the gloves on their hands for ten minutes, and this ritual will be repeated around 20 times in their lives. This tradition is followed by the Sateré-Mawé people and if i remember correctly, Steve-O tried this tradition in the infamous TV show "Wildboys". Bomena is a tradition in parts of the Himalayan kingdom. Young men go out at night to search for love, by sneaking into the rooms of eligible spinsters. They have to spend the night, and if they are caught, they have to get married. 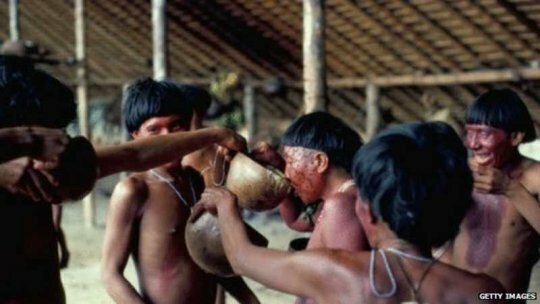 The Yanomani people live in the Amazon rainforest. There’s around 35,000 people spread in around 200 - 250 villages. One of their traditions is called endocannibalism. This is where they consume the ashes of their dead. They even store ashes to be consumed in years to come. They wrap the body in leaves, and rest it in the rainforest for ants to consume the flesh. They take the bones, burn them, and make a soup from the ashes and bananas. The Yanomani people don’t talk about their deceased relatives, except on the day of remembrance. On this day, reserved ashes are consumed, giving strength to the people and keeping the deceased memory alive. The tradition of Manusa Yadnya believes that tooth filling can help relieve feelings of greed, envy, lust, anger, confusion, stupidity, and intoxication. This tradition is part of becoming an adult, so boys begin once they reach puberty, and girls once they have had their first menstrual period. It can also be part of the marriage ceremony. Once it has finished, the father no longer has a duty to his daughter. It may also be performed before a corpse is cremated. In the state of Karnataka, infants are thrown from the balconies of houses. This tradition is supposed to bring them good luck, health and prosperity. The balconies are at least 30 feet above ground. The baby is thrown towards a piece of cloth held by a couple of people on the ground. Children’s rights groups have called it barbaric, and asked the Indian government to ban it. This tradition has been ongoing for more than 500 years.